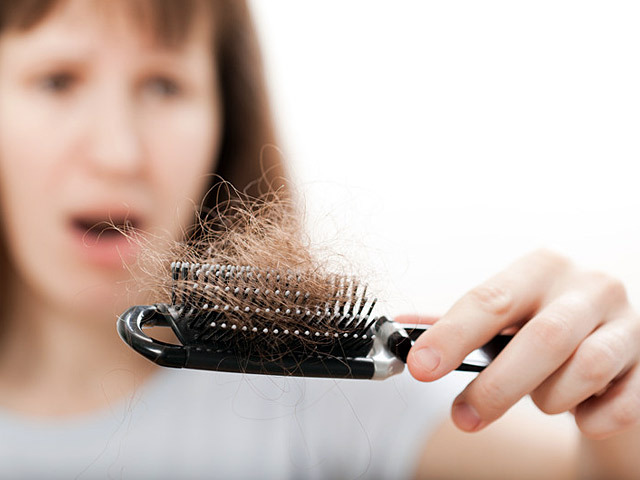 Many are noticing signs of hair loss, panic and start buying tools to fix this problem. Unfortunately, it is not always the cosmetics purchased in stores, are able to stop hair loss, but the popular, centuries-tested methods often help to forget about this problem. In a glass of warm milk dissolve 50 g yeast (for making masks is better to use the "live" compressed yeast). Leave the yeast mixture in a warm place for about half an hour. After allotted time, add the milk, 1 tsp honey, 1 tsp of cognac and egg yolk. Stir the mixture and apply on the scalp and hair. Cover your head with polyethylene or wear a special hat and wrap head with a towel. Keep the mask for about half an hour, after which wash. When strong hair loss this mask can want 1 every 2-3 days, because it contributes to the strengthening and growth of hair, nourishes and adds lustre. Mask for hair from falling out on the basis of the bow is a very effective, proven tool for centuries. Take fresh onion juice without pulp (1 tbsp) and the same amount of castor oil. Mix and add 1 tsp of honey, cognac, alcohol tinctures of calendula. Then add in the egg and egg yolk and carefully mix all the ingredients. Apply the mask on hair and gently RUB into the roots. Wear a plastic cap and wrap head with a towel. Keep the mask half an hour, rinse off, and to eliminate the onion smell rinse your hair with water with lemon juice or fruit vinegar. Hair treatment using such a mask could be made more effective by adding a mixture of clove, passed through press the garlic. To make onion mask 1 preferably once a week. If the hair is rapidly thinning, you should find out why your hair falls out, maybe they just do not have enough vitamins and so this shortage must be addressed. Homemade vitamin hair mask is prepared is quite simple: mix 2 tbsp of castor oil and tincture of calendula, add 1 yolk and half a teaspoon of oil solution of vitamins A and E. the Resulting mixture RUB into the roots, then comb the hair to the mask is well distributed. Keep this vitamin a mask is necessary for 2-3 hours, with the head do not have to wrap up. Vitamin hair mask can be done 1-2 times a week. Many trying to learn how to treat hair loss, faced with the fact that most of the recipes of masks contain a mustard or red pepper. This is no accident. Mustard and pepper are the foods that improve blood circulation, nourish the hair and "awaken" the hair follicles, stimulating growth. To make a mask based on mustard, take 2 tbsp of mustard powder, add 2 tbsp olive or burdock oil, 1 egg yolk and 2 tsp of honey, mix well and RUB mixture into the hair roots. Keep the mask for at least 15 minutes. Do not use this mask in damaged skin, as mustard can cause severe burning. It is recommended to do a mustard mask 1 every 7-9 days.